Whether you’ve been happily married for 10 years or 50 years, love has a unique way of binding two people’s hearts and growing them together. Throughout marriage, you learn to understand the unique needs of your partner. These include physical, emotional, and spiritual needs, wants, and desires. After many years of being together, your wedding may seem like a beautiful yet distant memory. If you are looking to renew your original commitment and share a special time of recommitment, a vow renewal ceremony may be for you. And what better way to renew your nuptials than with a destination ceremony? Planning a destination vow renewal ceremony requires careful choosing of the perfect location for the event. From prices to amenities, couples struggle to make a confident decision about the location. Before booking a venue, do thorough research to pick a relaxing, laid back spot to help you and your partner remember the importance of your relationship. Many couples choose to conduct their vow renewals at the venue where they married originally. However, choosing a Bahamas destination can provide an extra-special intimate getaway for couples ready to celebrate their relationship. Vow renewals happen for many reasons. Some couples may have gotten married at the courthouse and never had a public declaration of their love. Other couples use vow renewals to strengthen their relationship after a challenging season. Partners witness immense growth in their spouse, and marriages undergo radical transformation throughout many years of children, new careers, illness, and family life. When relationships survive hardship, celebration is a necessary acknowledgment of growth and of the strong bond between two individuals. Vow renewals represent a sacred area of a relationship. A vow renewal shouldn’t be wedding round two. While weddings are glorious events, they don’t necessarily need to be repeated. Yes, brides might want to wear a special white dress again, but don’t make a vow renewal about the pomp. A vow renewal should focus closely on the sincerity of the relationship between two people. Forget the registry, forget the elaborate cake, and forget bridal showers. These aren’t necessary for vow renewals. Also, don’t expect other people to pay for everything. The couple should be the hosts, and if guests are invited, they should be treated as such. Provide a nice meal, complementary beverages, and other perks. Vow renewals don’t need fuss. In fact, simple is often the best choice for couples. The renewal is for each other, not for the crowd, so the pageantry isn’t necessary. Think about ways you can make the experience special for your partner instead of focusing on what you might get out of it. Most couples considering a destination vow renewal usually have extensive regular life expenses from education costs for kids to monthly mortgage payments. Therefore, a budget is an important part of planning a romantic getaway. Choose an affordable venue, accessible destination, and reasonable accommodations. Investigate all options fully before making any initial financial commitments. Discuss the event together and mutually establish a price cap for the celebration. Planning a destination vow renewal ceremony during the off-season can save a substantial amount of money if the couple is willing to risk less favorable weather. Picking the perfect Bahamas vow renewal destination is challenging. The market is flooded with options, deals, enticing amenities, and other things designed to trap naïve tourists in costly agreements. It is possible to avoid these dangers with appropriate research. Consider scheduling a meeting with a wedding planning or travel agent to get advice concerning affordable options. After surveying the options, narrow the list to three or four promising choices. Compare prices, accommodations, and amenities to choose which location best serves your budget and ideas. Guests aren’t a necessity for vow renewals, but some couples like to invite their children or dear friends to witness the event. Remember: more guests means more expense. Use your budget to figure out how many people can attend without pushing you past your financial limits. Also, consider how inviting other people will change the tone of a vow renewal. Some couples need the support of family and friends, while others want the ceremony to only be for the benefit of each other. Both types of ceremonies are meaningful, but partners should discuss the topic together before opening the event to other people. Guests or no guests, couples should properly celebrate their marriage after a vow renewal. Even if it doesn’t take place on an anniversary, treat it the same way. Enjoy good food, relax on the beach together, and bask in the beauty of island scenery and culture. The Bahamas create the perfect background for the romance of vow renewals. Embrace the beauty of your surroundings. A vow renewal requires one essential component: actual vows. Some couples like to repeat the original words they spoke on their wedding day. Others choose to write new vows more representative of their relationship now. Regardless, refer back to the originals before composing new vows. Individuals who choose to write new vows will probably incorporate similar themes from the originals but tailor the new ones to speak to the experiences, events, and challenges faced throughout a marriage. If the budget allows, plan to stay in the Bahamas for a few nights after the vow renewal ceremony. A mini-honeymoon is a perfect way to enjoy a few more evenings on the beach, drink milk straight from coconuts, and fall asleep to the sound of waves lapping the shore. Renew and refresh all aspects of your marriage after the vow renewal ceremony is over. Planning a vow renewal ceremony in the Bahamas speaks to the value a couple places on their relationship. A relationship becomes stronger when people speak out their appreciation for one another and show respect for how their partner has grown over the years. Choosing to celebrate in the Bahamas creates the perfect setting for strengthening the bond of marriage and rekindling a sense of romance. 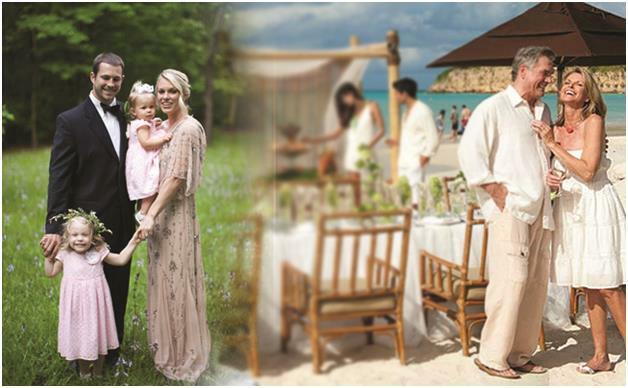 Contact Chic Bahamas Weddings today for more information on Bahamas vow renewal ceremonies.